Linda Loosli, an educator and philosopher who worked in several states and some international schools, had an accident that left her bound to a wheelchair. Michael Bingham, founder of Jump the Moon Foundation, heard her speak in a class and recruited her to help his cause: teaching people with disabilities to be creative. 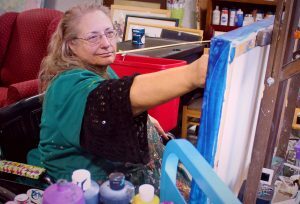 Linda Loosl, who is wheelchair bound, works on a painting at Jump the Moon art studio on Main Street in Logan recently. .
At the time, he didn’t know Loosli was an accomplished painter and had sold her work in a gallery before her accident. In 2005, while teaching in Arizona, Linda caught her toe on the shoulder of a cement walk. She fell and hit her head, suffering a brain stem injury that left her a quadriplegic. She had extensive therapy and had to relearn how to eat and talk. She is wheelchair bound, but now can use her arms and hands. 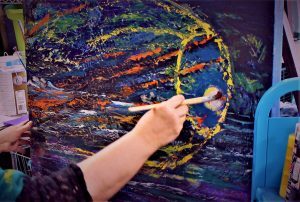 Linda Loosli, a wheelchair-bound artist touches up one of her paintings. Jump the Moon Foundation, located at 553 North Main Street in Logan, is a nonprofit art gallery and vocational arts program, dedicated to giving people with disabilities an opportunity to make and market their own artwork. While they have been open for several months, Jump the Moon is holding its official Grand Opening on Sept. 28th and 29th from 5 p.m. until 9 p.m. The hope of the gallery is that these artists can make an income by selling their art, forge lasting relationships, and gain the skills necessary to be successful as an artist. Bingham, the founder and creative director of the foundation, is a high school art teacher and professional artist. He said he takes in any kind of disability. Some of the people attending have obvious disabilities and some are not so obvious. There will be a gallery and some of the work will be for sale from their artists.